For hundreds of U.S. companies caught up in the shale oil boom over the last decade, that's disastrous news. At $60 a barrel, many oil companies will not generate enough revenue to break even. The root cause of this extended period of uneconomic oil prices, according to the IEA, is the decision by the Organization of the Petroleum Exporting Countries (OPEC) to continue producing at 2014 levels. OPEC is made up of member countries like Saudi Arabia, Iran and Kuwait. The idea behind OPEC's production mandate is to force many of the newer unconventional producers out of the market. While this will greatly impact OPEC's own budgets, that strategy might end up bearing fruit. Nonetheless, there's a far different winner in this story... one OPEC might not have even considered. To understand this side of the equation we have to first look at a completely different part of the energy industry. 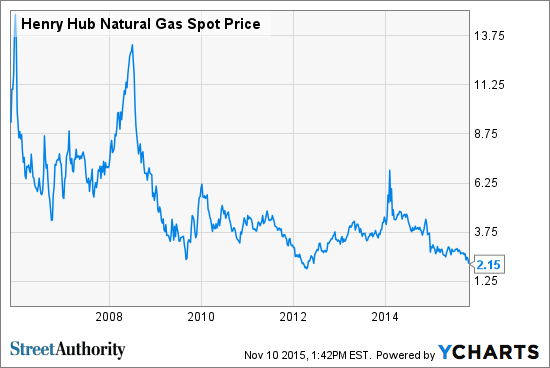 It all started back in 2008, when natural gas prices began to come off their all-time highs. Since then, natural gas -- like oil today -- has become uneconomic to produce for many companies. But every crisis presents an opportunity if you know where to look. Companies like Exxon Mobil (NYSE:XOM) and Chevron (NYSE:CVX) knew where to find those hidden opportunities. They began buying up natural gas resources on the cheap when prices were bottoming out. One of those deals presents us with our own opportunity today. But I'll get into all of that in a moment. First you need to understand why natural gas is worth investing in at all. After all, as you can see above, prices haven't recovered in the slightest in all these years. Here, it comes down to simple supply and demand. On the demand side, we're already seeing the use of natural gas in everything from power generation to fuel for cars grow at breakneck speed. Despite the coal industry's promotion of so-called 'clean coal' technology, natural gas remains less harmful to the environment. And coal plants are easily convertible to gas-fired ones. According to the U.S. Energy Information Administration (EIA), coal supplies 41% of the country's power compared to 27% from natural gas. But over the next 20 years, those numbers are going to flip. By 2035, natural gas will be the backbone of power generation across the country. As for natural gas in vehicles, that's a longer -- and possibly more lucrative -- story. Already companies like Waste Management (NYSE:WM) and government agencies like the Department of Defense have been slowly switching over from gasoline to natural gas to power their fleets. We're also seeing new designs and engine types in development for commercial vehicles. This should continue to be a growing area of demand for natural gas. None of this even touches on the boom in LNG and demand for cleaner fuels in places like India and China. But there's also a compelling case for natural gas on the supply side too. As it stands now, much of the U.S. production of natural gas comes as a by-product of oil production. Meaning they are produced together. What do you suppose this extended period of low oil prices will mean to natural gas production? As OPEC gets its way and shale oil production slows, so will the amount of natural gas available in the market. So the case for natural gas prices rising faster than oil prices over the next few years is obvious. The question that remains is: who will be producing natural gas and profiting from its eventual price recovery? That brings me back to those companies that bought all those natural gas resources years ago on the cheap. The biggest winner will be Exxon Mobil Corp.
You see, Exxon made the largest move -- and the most aggressive -- when it bought XTO Energy for $36 billion in 2010. XTO was the largest U.S. natural gas producer at that time. So now Exxon is sitting on one of the largest piles of natural gas ahead of that fuel's inevitable price rise. What's more... most of Exxon's oil reserves are of the conventional kind. Meaning it can still produce profits from its traditional business at $60 per barrel AND take advantage of its ocean of natural gas just as those prices rise. But the real seal on this deal is Exxon's share price. For the average investor a bet on Exxon's stock might seem like a bet on oil. And with this prediction from the IEA, that seems like a bad gamble. On the contrary... that gives smarter investors a real opportunity. At today's price Exxon's stock is offering investors a dividend yield of 3.6%. That's much higher than most times in its history. And as I just showed you, this could even turn into a growth opportunity on top of a great income producer for you. Risks to Consider: Investors will continue to treat Exxon as just any other oil company. So an extended period of low oil prices might not result in immediate capital gains for XOM owners. However, with the company's large dividend, sustainable operations and this growth potential, a little wait will be well worth it. Action To Take: Pick up shares of Exxon Mobil while it remains cheap. Its deal with XTO will begin paying off in spades as natural gas prices begin to finally rise. Meanwhile, you can continue to collect its steady and sizable dividend each and every quarter.